The Community is a venue for a variety of organizations. They take part in research, development and propagation of Jewish cultural heritage. 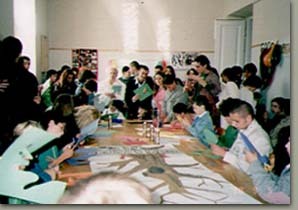 For ten years the Community has been holding the Jewish lectorium. Each Sunday people gather to listen to lectures on the topics of Jewish history and culture, to find out more about the eminent figures of the past, Jewish traditions, memorable events. Lectures often conclude with concerts. 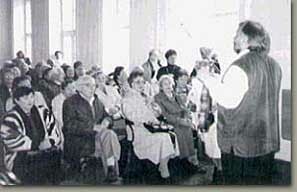 People come here not only to listen to lectures, but also to communicate in Yiddish. Popular among intellectuals is a Jewish cultural club. The club's focus is Jewish and Lithuanian cultural interaction. Not only Jewish intellectuals but also many Lithuanians and Russians attend club events, which often include lectures by Lithuania's most prominent cultural figures. Brought from the oblivion are the names of prominent figures of Jewish art, who enriched Lithuania's culture, such as, for example, the founder of Lithuanian variety art Daniel Dolskij, who is unknown to the modern generation, and whose abandoned grave can be found in Kaunas, or brothers Hofmeklers as well as many others. The youth is also engaged in the studies of Jewish legacy Thus the continuity of our culture is ensured. A popular youth club "Ilan" organizes holiday celebrations, discussions about the history of Lithuanian Jews. Children put in order the graveyard. They are taught tsdoke (in Yiddish - charity) - a very important tradition of Jewish life. Children are very enthusiastic about that. They attend to the sick, elderly people, bring them presents. Both 6 year old children and 16 year old teenagers engage themselves in interesting activities at the youth club "Ilan"
Community's newspaper "Jerusalem of Lithuania" also dedicates a lot of its space to cultural heritage. It is a unique newspaper, perhaps the only Jewish newspaper in the world published in four languages - Yiddish, Lithuanian, English, and Russian. It publishes a lot of articles about today's culture. Its readership include Jews from abroad, especially litvaks. In addition, a TV program "Menora" and a radio program for Jews are also dedicated to the Jewish culture. A novelty in our cultural life is the Vilnius Program in Yiddish, to be held next summer for the time in a row. Vilnius was one of the most important centers of Yiddish culture before the Holocaust, therefore the Program, launched in the summer of 1998, instantly gained international success. About 70 people of all ages from 14 different countries gather in Vilnius to study or improve their Yiddish. It is very exciting to hear Yiddish in the auditoriums of Vilnius University, where before the war functioned the Department of Yiddish language and Literature, headed by a famous scientist dr. Noakh Prilutski. We can only be glad that huge efforts bring desired results. A leader of a large delegation from abroad, which visited the Community recently, noted: "Although the Jewish community of Lithuania is unfortunately a small one, it is very active and cares for its cultural heritage. We were charmed by the professionalism and unique continuity of national traditions carried on by the art bands that we saw".